Child Care Basics Resource Blog: Alligator Math: Which One is More? The greater than and less than symbol can be very confusing for young children. An Alligators mouth is a useful tool; to show kids which end of the symbol points the large or small number. Alligators are big and hungry! His open mouth is like the wide side of the symbol <. When you are super hungry you would rather have a whole plate full of yummy food than just one spoon full. The same goes for the alligator he want the one with the MOST food. So which one would the alligator want to eat? 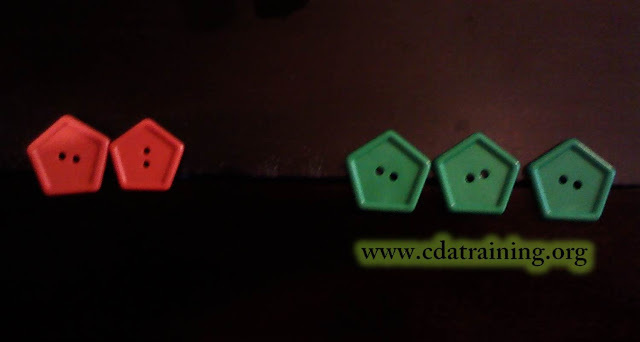 Q: Would he eat two red pentagon buttons or three green pentagon button? A: He would eat the three green pentagon buttons! 2 < 3, or Two is less than Three. Q:Would he eat three heart buttons or one green pentagon? A:He would eat the three hearts ! 3>1 or Three is greater than one. Our alligator tool was made from craft foam and googly eyes. They could easily be prepared for a whole classroom.